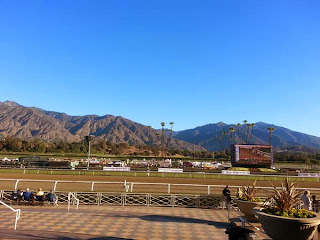 R6 Marathon (1 ¾ mile, dirt course): Perhaps the toughest race on the card from a handicapping perspective, the Marathon has a recent history of upsets including the two most recent winners: Afleet Again in 2011 and last year's winner Calidoscopio. While this year's bunch may be tough to separate, I'm keen on Indian Jones, who's recent form tells me that he's a contender. While his two allowance wins over the summer may not be anything to write home about, he finished a game second to 2010 BC Marathon winner Eldaafer after dueling him down the stretch in the G3 Greenwood Cup and he also showed an impressive late kick in his most recent at Laurel Park. He should relish the added distance and his running style will be a positive. Others to watch include Old Time Hockey, who will be stretching out and switching to turf, but who's fourth place finished behind the likes of Indy Point, Vagabond Shoes, and Lucayan after swinging wide around the final turn in the G2 John Henry Turf Championship Stakes was impressive. 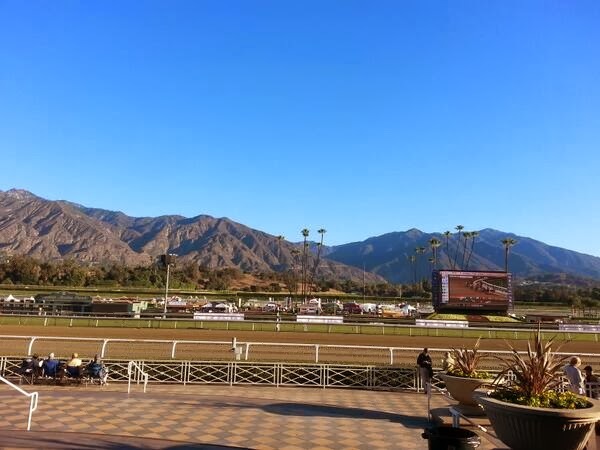 Blueskiesnrainbows has shown an affinity for Santa Anita in the past, but his recent form is questionable and going wire-to-wire in this race will be a tough ask. R7 Juvenile Turf (1 mile, turf course): Historically, this race favors the Euro shippers and I don't expect this year's edition to be any different. Outstrip comes into this race off of a third place finish behind War Command in the G1 Dewhurst Stakes at Newmarket, but I'm not sure he took a liking to the ground, which was rated “good to soft.” His prior races included two relatively easy wins and a very close second to the top-rated European two-year old Toormore in the G2 Veuve Clicquot Vintage Stakes. If this son of Exceed and Excel runs his best and can stay the extra furlong, he'll be tough to beat. The sky is the limit for Bobby's Kitten if he repeats the effort he gave in his most recent outing in the G3 Pilgrim at Belmont. After rating off of the early lead set by Marvin's Miracle, he blew the doors off the field en route to over a six length victory. He aims to be the latest of a laundry list of Kitten's Joy progeny to win an American G1 turf race this year. The Aidan O'Brien-trained Giovanni Boldini has won two of the three races that he's contested this year, including his most recent easy 4 ¾ length victory at Dundalk. R8 Dirt Mile (1 mile, dirt course): With the probable favorites all drawn on the outside, this race figures to be one of the best betting races on the card. Fed Biz most recently rallied to defeat Goldencents and BC Sprint contender Wine Police the G2 Pat O'Brien Stakes, which was contested over the all-weather surface at Del Mar. His come from behind-style should be aided by a healthy early pace and two recent bullet works over the Santa Anita dirt suggest he's ready. Hymn Book is another one that should benefit from the likely pace scenario. His most recent run in the G2 Kelso at Belmont was nicer than it appears on paper. After being brushed at the start and spending most of the race boxed between horses, he was able to find running room down the stretch and just narrowly missed out on place honors. As far as the favorites go, Verrazano is a beast when at his best. His win in the G1 Haskell was arguably the best race by a three-year old all season and a line can easily be drawn through his Travers and Kentucky Derby runs as 1 ¼ miles appears to simply be too far for him. He will have to overcome an outside post, however, and that may simply be too much to ask. R9 Juvenile Fillies Turf (1 mile, turf course): This is perhaps the race that sports the deepest Euro bunch of them all. French shipper Vorda has won four of her first five starts, with her only loss being a one-length defeat to the highly regarded colt No Nay Never. She is untested past 6f, but bear in mind her sire Orpen is a son of two-time BC Mile winner Lure, so the potential is there. Racing Post ranks Chriselliam as the top two-year old filly in Europe for good reason. This daughter of Iffraaj most recently won the G1 Shadwell Fillies Mile at Newmarket over the second-highest ranked European filly (according to Racing Post), another daughter of Iffraaj: Rizeena. The lightly-raced daughter of Street Cry Sky Painter was very impressive in what was just her second outing when she was nosed out of a win in the G3 Miss Grillo Stakes at Belmont. She was forced to go very wide in that outing and yet, she showed a strong final kick in the 1 1/16 mile contest. Her only other race was a win over Super Sky, who easily broke her maiden in her next outing. R10 Distaff (1 1/8 mile, dirt course): Count me in the group that believes there will be a speed duel up front, especially with the two likely sources of early speed being drawn side-by-side. Pletcher-trained Authenticity should benefit from that pace scenario and her inside post will be beneficial, as well. She has spent the bulk of her season snagging runner-up honors, but her final prep in the G1 Zenyatta at Santa Anita was sneaky good. After spending much of the race boxed between foes, she unleashed a nice closing kick to get within 1 ¼ lengths of wire-to-wire winner Beholder. Authenticity also boasts two recent 4f bullet works, which suggests she may be peaking at the right time. The aforementioned Beholder loves Santa Anita, as was suggested by her recent win in the G1 Zenyatta, as well as, wins in the G1 Santa Anita Oaks, G2 Santa Ynez Stakes, and last year's G1 Grey Goose Breeders' Cup Juvenile Fillies. If she's able to shake Royal Delta loose early, this race will be hers for the taking. Princess of Sylmar has undoubtedly been this year's American breakout star. Not only has she won six of her seven races this year, but she has beaten the likes of Beholder, and most recently, Royal Delta. Her connections had previously stated, however, that she was not pointed to the Breeders' Cup, so the relatively last minute decision for them to bring her is a bit worrisome. R4 Juvenile Fillies (1 1/16 mile, dirt course): Undefeated Tapit filly Untapabale was impressive when she won the G2 Pocahantas in only her second start and off of a nearly three month layoff. By all accounts, she has looked fantastic in her recent works. Concave was closing in the G1 Del Mar Debutante, but ran out of running room. The extra furlong here should help this steadily improving filly who will run on dirt for the first time. She's a Tiger finished a game second over the course after breaking from an outside post. Her recent works have been some of the best of the bunch, but she'll have to overcome a tough post, yet again. R5 Filly & Mare Turf (1 ¼ mile, turf course): The winner of four-straight Laughing looks as if she'll be allowed to snag another easy lead this time around. Her most recent win in the G1 Flower Bowl was at this distance and she has been flattered by the likes of Pianist and Tannery, who rebounded to win the G3 Athenia and G1 E.P. Taylor respectively after losing to her. If someone is going to pressure Laughing, it may very well be British shipper Romantica. She'll be wheeling back to her preferred distance and the quicker ground should suit her well. This daughter of Galileo was very impressive two-back when winning the G1 Prix Jean Romanet over Dalkala, who rebounded to win the G1 Prix De l'Opera, and a repeat of that effort would be tough to beat. Tiz Flirtatious who most recently won the G1 Rodeo Drive over this course loves Santa Anita and her recent form suggests she's a contender. R6 Filly & Mare Sprint (7f, dirt course): Dance Card won four-straight before a troubled trip in the G2 Gallant Bloom Handicap resulted in a third place finish. She's working well, however, and when at her best, she's better than this bunch. Like Dance Card, Sweet Lulu also won four in a row before falling to Distaff contender Close Hatches in the G1 Cotillion. She's dangerous while wheeling back to 7f here. Since finishing eighth in last year's Filly & Mare Sprint Teddy's Promise has yet to finish off of the board. She has won three of her last four starts at Santa Anita and a win in the local prep suggests she's ready. R9 Turf (1 ½ mile, turf course): On paper, British shipper The Fugue is head-and-shoulders above this group. The four-year old daughter of Dansili has most recently won two G1's, the most recent of which was ahead of well-regarded European runners Al Kazeem and Trading Leather. She finished an unlucky third after a troubled trip in last year's Filly & Mare Turf and she comes back even stronger to face the boys. Big Blue Kitten,the son of top American turf sire Kitten's Joy, is a nose away from having come here the winner of three straight. He was much the best in defeat to Little Mike last time out, however, and he figures to compete for a piece if he can effectively weave through traffic and handle a wide post. At his best, last year's runner-up Point of Entry is one of the best in the business, but I am a bit concerned about him coming off of an injury and a long layoff. R10 Sprint (6f, dirt course): The rail may not be the best spot for him to start, but it's hard to ignore Justin Phillip, who seems to have finally come into his own at five-years old. After finally winning his first G1 in the Alfred G. Vanderbilt Handicap at Saratoga earlier this year, he showed that result was no fluke when he was narrowly defeated by Private Zone in the G1 Vosburgh after a literally bumpy trip. Secret Circle may have been out of the game for over a year, but you would have never known it from his victory over the course in his first race since the layoff. His two most recent works at Santa Anita were bullets, which is encouraging. Wine Police was also away for over a year before returning this season. He won both of his 6f races this season and could pull off a big upset. R11 Mile (1 mile, turf course): After finding little success in Europe, No Jet Lag is two-for-two in the US, including a win in the G2 City of Hope Mile over this course. He'll need a healthy pace to close into, but that shouldn't be an issue here. Wise Dan is obviously the superstar in this race and although you can draw a line through his most recent outing, which was taken off of the turf and in which Silver Max was let loose on the lead, him drawing a wide post is enough for me to not take him at even money and the probable pace scenario won't play to his strengths. The recent winner of the G1 Queen Elizabeth II Stakes at Ascot Olympic Glory is as classy as they come, but two weeks may be too quick of a turnaround for him. He should benefit from a likely quick pace up front, however. R12 Classic (1 ¼ mile, dirt course): The son of 2007 Breeders' Cup Classic winner Curlin, Palace Malice will look to follow in his father's footsteps with a win in the most prestigious race on the card. After easily winning this year's G1 Belmont Stakes, he backed up that effort with a victory in the G2 Jim Dandy at Saratoga, but it's his defeat in the G1 Travers that showed what he's really made of. After stumbling badly out of the gate and having to go very wide, he furiously closed down the stretch to finish less than a length behind the winner: Will Take Charge. In his most recent start, he ran a big one, beating the likes of Flat Out and Last Gunfighter in his first start against elders, albeit in defeat to Ron the Greek. You'd be hard-pressed to find a horse that loves Santa Anita more than last year's runner-up finished Mucho Macho Man. He most recently won the G1 Awesome Again with style at Santa Anita and by all accounts he's looked great in his recent works. Aidan O'Brien-trained Declaration of War has faced top-class foes all year long and aside from his two G1 wins, he also boasts solid finishes behind standout miler Moonlight Cloud and multiple G1 winner Al Kazeem. He'll have a big chance if he can handle the dirt.